These translucent agate guitar picks will add natural beauty to your equipment. 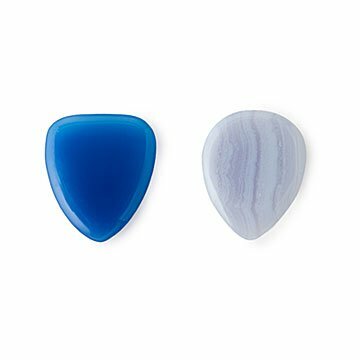 Ideal for precise picking, these translucent agate guitar picks will add natural beauty to your equipment. The thick picks are designed to be stable and easy to grip, with an angled taper that leads down to a well-defined playing tip (though not so sharp that the tip becomes brittle). Whether you prefer blue lace or banded Botswana agate, these unique picks make great additions to your own collection or well-tuned gifts for any six-string devotee. Made in China. I ordered the bostswana. What I recieved was nothing like the picture. It was an ugly solid yellowish grey. I called and they told me that was discontinued (it probably shouldn't be an option to buy anymore then!) So I ordered the blue lace one hoping for better luck. It was also NOTHING like the picture. Solid Cobalt blue. Such a misrepresentation . I intended to give this to my guitarist boyfriend for Christmas. I thought it would be a unique and thoughtful present. Unfortunately, I will not be giving this to him at all. It's not unique or special at all. It's a murky grayish white. I ordered the Botswana that shows a lovely variety of colors in the picture. The package I received was labeled gray. And yep, it's gray. Nothing like what is shown as being Botswana in the picture. I understand that there would be variances, but this isn't remotely close to what I thought I was buying.